I’m interested in dipping my toes into more cultural history, especially surrounding foodways. I heard the new book from the editors of Garden & Gun, S is for Southern: A Guide to the South, from Absinthe to Zydeco was launching at the Atlanta History Center and figured that would make a good event to attend and recap here. I’m honestly most familiar with Garden & Gun through the work of John T. Edge, founder of the Southern Foodways Alliance and frequent contributor to the magazine. He was not there, but another writer crush of mine, former Time, Inc. honcho John Huey, was the panel moderator. This was my first time attending an Atlanta History Center program, and I will definitely be returning. Everything from drinks to snacks to the actual panel was very well-organized and deserves to be lauded. Tickets to this event were $35 and included a discount on copies of S is for Southern. I’m not a huge whiskey fan, but Chris is, so I’m trying to get more into it. I tried something called the “New” Fashioned—basically an old fashioned with elderflower liqueur, perhaps simple syrup, and seltzer or club soda. I regret not taking a picture of the recipe to know the exact ingredients, because it was delicious. And, of course, y’all know I’m all about finger foods. I tried everything and it was all great. I also completely forgot to take a picture of the menu, so I wrote down what I remembered everything was. I’m clearly way out of practice from reporting! There was also some time to walk around the new and expanded exhibits. 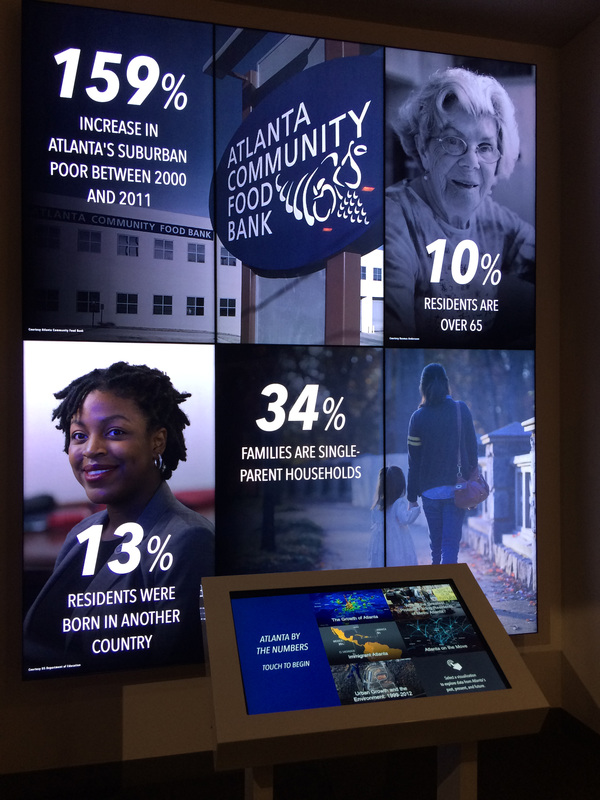 I haven’t had a chance to fully check out Gatheround: Stories of Atlanta, but the few moments we sneaked away to check it out were worth it. I already learned so much just from wandering aimlessly; going with a purpose would be even more enlightening. 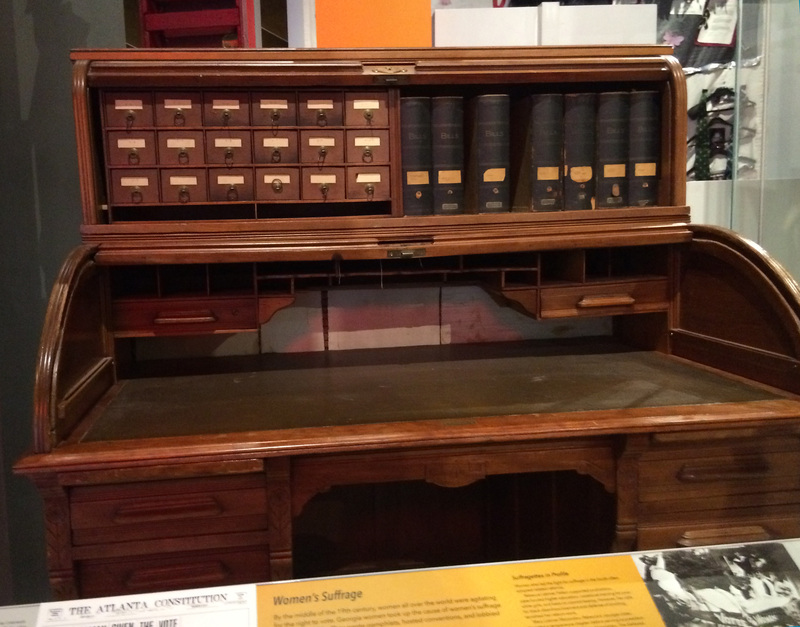 Old Atlanta Constitution reporter’s desk (with way cool story files). Then, with a copy of the book (thanks to the speakers for their marathon signing session! ), we headed home. Weekday events are completely exhausting, but well, well worth it for something as fun as this. Lagniappe is not one I’ve heard or used myself! I attribute the surcee usage in my family to our origins in the mountains versus having zero Cajun/creole heritage. Makes sense. I don’t remember when I first came across lagniappe – maybe the first time I went to New Orleans 30 or so years ago. I don’t recall hearing or reading sure until your blog. Maybe I blew past it in a Pat Conroy book. There is a contractor here in Charlotte with a company name Lagniappe. Surcee would seem more appropriate given the Scotch influence here.